Welcome to my latest interview with Fakulteti.MK. It is a web-site dedicated to high educational institutions in Macedonia and their aim is to aid future students choose their majors and direct present students towards acquiring and increasing their knowledge, skills, scholarships and jobs. I translated it for you with some slight adaptations. Enjoy! Maya Kuzman has been teaching ESL for 18 years in a primary school in Skopje. 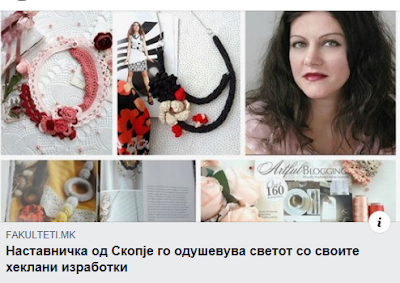 She is one of the first bloggers in Macedonia and the success and the incredible reaction to The Little Treasures has motivated her to create her brand which exists for almost 9 years. Inspired by traditions and childhood memories of the talented women she grew up with, Maya Kuzman has been creating art for almost 10 years. 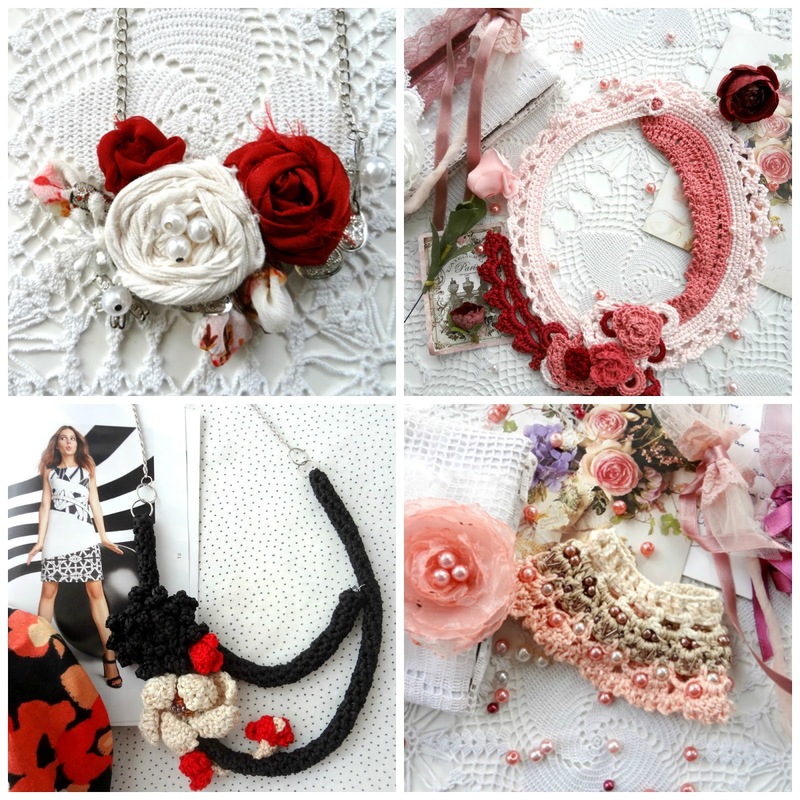 Her mixed textile and crochet jewelry designs delight the world. One of the most prestigious, creativity inspiring magazine - Artful Blogging, invited her to tell the story of her blog and brand The Little Treasures. Fakulteti.mk tells her story - Maya was pleased to reminisce her childhood and her family where traditions were deeply rooted and respected and handmade work as its important and inseparable segment was of paramount importance. The women in my family were dedicated to handmade work - whether out of necessity or pure pleasure, sweaters, scarves and hats were knit, tablecloths and doilies were crocheted and clothes were sewn. We, the children, were always intertwined in this natural process and encouraged to create and develop our skills. From my first, uneven, crooked stitches, through glass, paper and clay beads, here I am where my play never ceases and I cherish it lovingly - she says. She is one of the first bloggers in Macedonia. The success and the great feedback of The Little Treasures have motivated her to create her brand of 9 years. Her daughter Eva is a proud brand ambassador. In the creative community she is mostly known for her necklaces and cuff-bracelets. I am satisfied that I already have as circle of constant clients. Today with the help of the internet, it is very easy to catch the interest of many people. Social media has been increasingly helpful and I love using them. The reactions are wonderful and they are an everlasting source of will and energy for me to continue doing what I do. Precious stones and gold has never been her material of choice or desire to use them in her creations. I was always attracted to handmade mixed media jewelry, a kind that carries a special story with itself and one that provokes most different feelings. I love the metal called zamak which I use in my oriental pieces, then there is my personal favourite and the most important material - the cotton thread, but I also lean towards and love using different textiles. The lace and the wooden beads are my weakness. As a teacher she believes teachers should be inspiring with their hobbies and interests they cherish. Both as a parent and a teacher, I believe that it is of exceptional importance the teacher to be a creative person. Creativity is the key for the emotional development of children, it invigorates innovation with children, encourages them to explore new horizons, urges them to seek new challenges and solutions. I want my classes to be creative an inspirational, so I indulge in a creative play with the younger learners where we create and express ourselves through different media, while with the senior students, the creative process is more subtle and set on a different level - she explains. She was invited by the online journal Artful Blogging to tell her story for their summer issue. Artful Blogging is a visually-inspiring online journal. Its name says it all. Blogging qualified as art. It is a magazine dedicated to the creative blogging community, where bloggers are invited to share their stories accompanied by engaging and enchanting photography. Currently Maya Kuzman is focused on her children's collection "Bohemian Babies", and she is designing her spring collection of jewelry and accessories inspired by the 1950s. I want to thank you if you managed to read through the end! Glad you were translating the interview! Google translater often makes such a mess out of things. Really looking forwards to your 1950's collection! That will be very interesting! Thank you for reading Marjan! I would love to be a student in your class. :) Congrats again on recognition of your long term blogging and constant creativity and inspiration. That is so sweet of you Tammy! I am truly honoured! Congrats on being featured in the blogging magazine and for your beautiful creations and teaching. Thanks for sharing at our Cooking and Crafting with J&J. Fabulous interview, Maya. I thoroughly enjoyed reading all about you. Upon reading everything, it struck me what a passionate and inspiring teacher you would be. Your students are so blessed to have a teacher such as you. How wonderful your were surrounded and immersed in creativity within your family circle from a very young age! You must have a heart filled with beautiful memories of your family creating all manner of beautiful pretties. Indeed these precious memories are there for us all to see in your amazing designs and creations.